Brian Miller is a native of Kinston, NC and is a graduate of North Carolina Central University. Brian was first exposed to music at his church and developed a strong passion for music at an early age. By the time he graduated from high school, he played saxophone, tuba, trumpet, snare drum, bass clarinet and valve trombone. 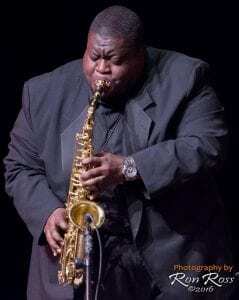 While a student at NCCU, he worked with jazz artists like Clark Terry, Dr. Lonnie Smith, Terrence Slide Hampton, Maceo Parker, Grady Tate, and Nicholas Payton, and played at the Montreux and Vienne Jazz Festivals. Brian performed with the NCCU Jazz Ensemble twice at the White House for President Bill Clinton, and the band has recorded his original composition, “Desmond Street.” He has also performed with Tom Browne at Blues Alley, performed “On-Air” live with Branford Marsalis for WNCU 90.7 FM jazz radio, played Dual Sax Battles with James “Saxsmo” Gates, opened up for “An Evening of Smooth Jazz” in Lansing , MI for headliner, Gerald Albright and remains in very high demand among jazz, gospel and R&B musicians alike.